I am an Ironman. I survived injury free. That makes me smile. It was a day with extreme weather, a swim that was called due to lightning, a seven mile decent on the bike in treacherous pouring rain conditions and a run that tried to beat me down, but I would not give in. I didn’t drink on the bike.I was in shock. The plan was to go through two roctane bottles on the first 56 miles then another two I would grab from my special needs. But I was cold, I was shivering, I ate a bit and had some water. I was just trying to get through the day safely. After I turned in the bike for my running shoes, I tried to take in chicken broth, soda, grapes, orange slices and more. Every run water station looked like a gas station to me. I needed fuel. Anything, please help me from this bonking. But it was too late. Everything I did religiously in training went out the window many many hours ago. No matter how bad I felt, after the vomiting, couldn’t walk straight, I believed. I didn’t panic. I heard my coaches voice and read his race day message over and over in my head. Then I switched over to the poem “if”. Then I smiled and talked to people along the way. I saw the flood lights and I ran. It was the end of 7 months of training and the most magical moment I have ever experienced. People asked if I cried, or if I celebrated like no tomorrow. Nope. Two volunteers grabbed me and sat me down. I couldn’t see my friends and family at first. I wanted them. I only wanted them. I didn’t want the pizza, the beer, the buffet dinner. I was physically and mentally done. I just wanted to see my loved ones and I wanted to talk to my coach. When I finally did, I got an appetite back and I went to sleep. I’m tearing as I write this. It was a long journey. 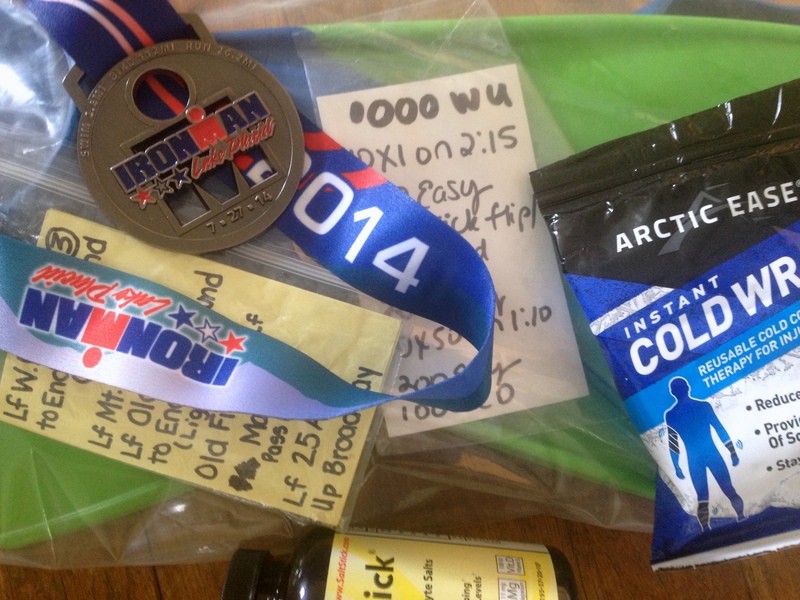 And what’s left is a beautiful mashup of Ironman Lake Placid 2014 memories and the fact that yes I am an Ironman. Congratulations! You are an Ironman! It was a tough day out there, and sounds like we had very similar experiences! Enjoy your recovery! Thank you so much Denise. Your first? It was my first finish. I had attempted IMLP twice before. First time.I got.hypothermic in the 2008 monsoon, and 2011, I missed the bike cutoff by 1 minute. Glad I finally did it! Was it your first?